I use a PC quite a lot, it runs Windows XP as most do, and being in France and having to type emails etc in French, I have a French keyboard. For reasons I won't bore you with, I decided to put a password on my system. Typed it in, retyped it, all is well until I come to reboot when the machine doesn't recognise my password, and I can't get in. Two hours of stress later, I discover that at some point in the process, it assumes you have an English keyboard, so the characters I was entering were not what is written on the keys. So I get an English keyboard to crib, enter the permuted password, and off we go. I have changed the password so that it is now the same for English keyboards as French ones. But this is sloppy programming. Fire the miscreant for wasting my time! On the other hand, I installed the Open Source operating system Ubuntu on my little netbook the other day, and it has performed astonishingle well, especially considering that it is free. I installed the operating system, then Skype, Wine and Spotify without a problem. It really is nice to find some software where you just have to follow the instructions and it does what it should. Spotify is a (legal) internet-based music player, so now I have the netbook plugged into my stereo on a semi-permanent basis. It looks cool and sounds good, too. 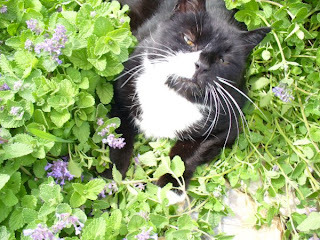 The catnip is out in flower; my cat got well drunk. 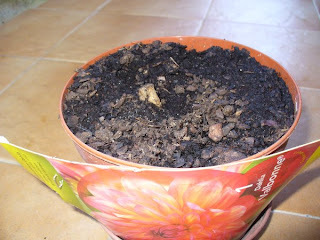 One of my favourite flowering plants is the Dahlia. 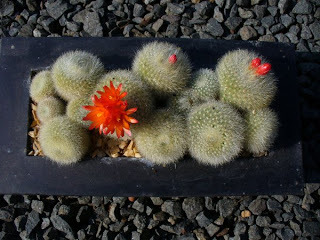 It flowers in Autumn, with bright waxy blooms in all colours. And it's easy to grow. 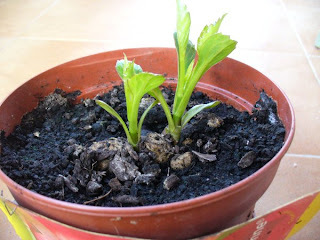 This time of year I occupy myself in taking Dahlia cuttings, either to increase my population of plants, or to get better value from tubers that I have just bought. This year is no exception, so I thought I'd share the process with you. 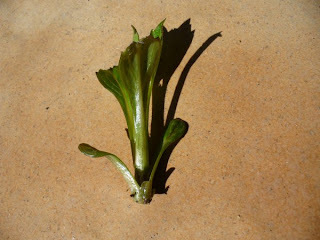 Once you have cut off the growing shoot, what you are trying to do is to give the shoot the opportunity to grow its roots before it dries out. 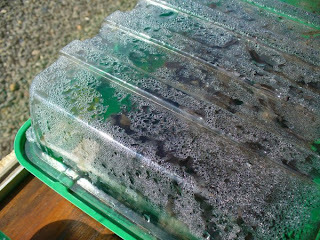 So you give it a humid atmosphere so that it doesn't dry out, put it into compost (with the aid of rooting hormone) and let it grow its roots in its own time. 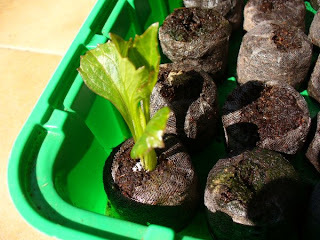 ...in a mini-greenhouse to keep the atmosphere humid. 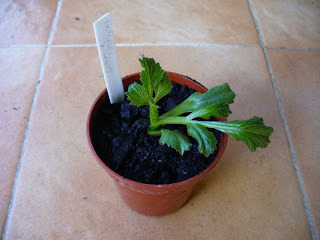 And the new plant is ready for potting.... don't forget to label it! Recycling is a big thing here in France, and we don't get to throw our rubbish out without having separated out all the glass, plastic, metal and newspapers. For more serious stuff, like car batteries, used oil, old fridges etc, there is the déchèterie up the road at Chammes. Now I like the déchèterie, because you can find all sorts of useful stuff there. If you have something to throw away that might just be useful to someone else, you don't put it in the skip, you put it alongside. If someone likes it, they take it. So I brought it home. 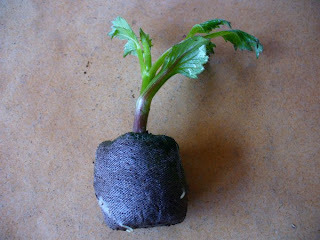 I don't pay it much attention, it sits on the window sill in the conservatory, and I water it occasionally in Summer. 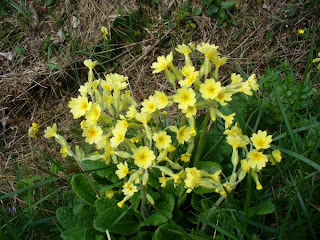 This spring it has rewarded me by bursting into flower. 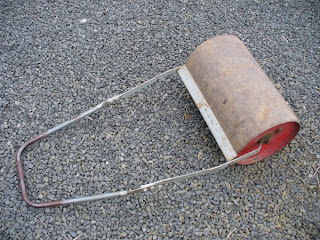 I have been looking out for a second-hand garden roller for a little while. My lawn needs some repair work, and a roller will be one of the tools needed. So when I saw an ad in the paper I made a quick phone call and decided to buy it. It was just under an hour away, and I wouldn't normally drive so far for a small purchase, but it was just up the road from a watchtower that gives spectacular views over the local countryside. I have also been wanting to visit that for a while, so I thought I could kill two birds with one stone. I arrived at the couple's house, did the transaction, and they invited me in for a drink. I don't like to drink before a long drive so we settled on coffee. I sat down in their kitchen and we started to natter. It turns out that their son is an English teacher in Mayenne, who lived a year in Egham, a stone's throw from where I used to live. It struck me that I had heard and read about Mayennaise people being reserved, even suspicious of strangers. A local French book on the area reports brightly that "you can be accepted as a local in only two generations". But my experience is almost universally of friendly people who are happy to invite you into their homes, have a meal with you, and generally be accepting and pleasant to deal with. The only thing that seems to upset them about English people (and my coffee hosts were no exception) is those of us who don't try to learn French. 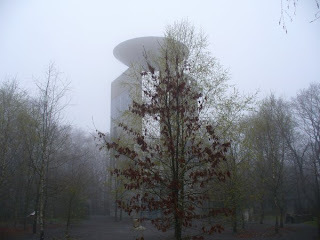 After the chat and coffee, I went on my way to the watchtower. Not a success on the face of it, the day was too misty with low cloud. But it showed me that the place is worth a re-visit when sunny, and this I will do, another day. The arrival of Spring in the Northern hemisphere is old news by now. 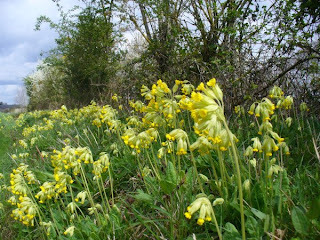 But I am still struck, as I drive around, by the way the ditches and hegerows here are splashed with yellow. 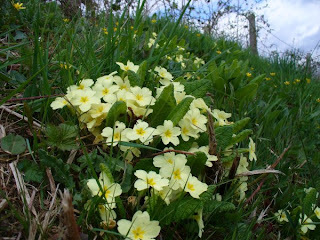 Primroses, Cowslips and Primulas have come from nowhere to welcome the Spring. Where do they go in Summer? You never see them. I think they are beamed down from an orbiting nursery for the Spring, and collected back up in June. It was the Spring Concert for the Harmonie on Saturday. 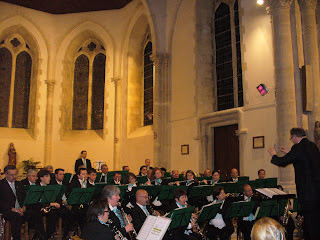 We all bundled into the local church at St Suzanne, and played a free concert for anyone who wanted to come and listen. Great fun! We were trying out some new pieces that we have only just started with, combined with some old favourites. Some went well, others need a bit more work. But we had a good time, and so did the audience. The programme included Simple Gifts, The Magnificent Seven, the music from the film The Incredibles, Bach's Air from Suite No. 3 ("On a g string"), Solas Ané, a medieval gaillarde, and others. And we finished up with drinks and bikkies in our rehearsal room. A nice night out.